For many years, inventors have observed the natural world. Through such study, they have solved problems and developed innovative products. And one of the best sources of observation and inspiration has been animals. Anyone who uses the road is familiar with catseyes, the reflective studs that mark the edge of a carriageway or traffic lanes. Catseyes are a major contributor to road safety because a vehicle’s headlights can pick them out along roads where visibility is otherwise poor. The inspiration for catseyes is in the name. In 1935, the inventor Percy Shaw based the reflectors on the cells in a cat’s eye that bounce back the light. 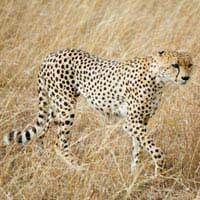 Cheetahs are the fastest animals on the planet. One of the reasons for such speed is the construction of their legs. Cheetahs have long ligaments that connect their bones, and long tendons that attach their muscles to the bones. These ligaments and tendons gather energy when stretched, and discharge it when they go back to their normal size. This elastic action speeds the cheetah forwards. Van L. Phillips was extremely unhappy with the prosthetic leg he received in hospital following an accident. He found he could only walk slowly and with difficulty. Van L. Phillips used the idea behind the cheetah’s legs to construct a prosthesis of his own design. The result was an artificial leg that enabled him not just to walk, but also to run. The beak of the kingfisher was the inspiration behind the nose cone of the 500-series Japanese bullet train. The kingfisher’s beak is extremely aerodynamic. Engineers applied its shape and principles to the bullet train’s nose cone to produce one of the world’s fastest trains. The same group of engineers also studied the plumage of owls. The owl’s saw-tooth style feathers reduce the noise caused by air resistance. This is one of the reasons why owls are such quiet and deadly hunters. The Japanese engineers used this natural technology when designing the 500-series bullet train. Their intention was to keep noise from air resistance to a minimum. The Gecko lizard inspired scientists at the University of Manchester to produce a sticky tape made without gum. The Gecko is able to traverse ceilings and walk effortlessly up and down walls. It achieves this thanks to the structure of the pad on each of its feet. The Manchester University scientists identified the natural technology behind the Gecko’s pads and applied it to tape. Sharks can accelerate and swim at incredibly fast speeds. Inventors decided to see of they could replicate this to help human competition swimmers. The result was the Fast Skin Shark swimming suit from Speedo. The suit copies the design of the shark’s scales. These reduce friction from water and thereby increase speed. Humpback whales are huge creatures. Yet despite their size, they are able to move through water with remarkable adeptness. A biomechanical engineer named Frank Fish studied the humpback whales’ flippers. He established that the tubercles – small rounded protuberances – on the flippers are one of the main reasons for the proficiency with which the whales swim. The tubercles gave Fish inspiration. He transferred the concept to the blades of wind turbines. He gave the blades a series of rounded, raised edges. Such blades create less noise and more energy at low speeds than equivalent turbine blades with smooth edges. I think its amazing that inventing was also about animals.But i wonder is it this animals only inspired inventors to invent.I would to be an inventor once i have an idea.I also wonder how can i made inventions great that people would want to buy?